Our Sturry office (3 miles east of Canterbury) is used for most Tuesday meetings and smaller meetings. 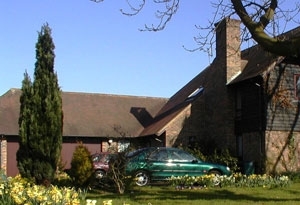 Cars can be parked in the large driveway in front of the property, or at the top of road near the Oast House. Please ignore the school "No parking" signs. We are located less than 0.1 miles from Sturry Station (trains from London, Ashford or Canterbury West). From the station (if arriving from London direction), cross the A28 and head downhill crossing the railway line and turning right into Sturry village. Turn right just before the Co-op shop, then first right into the Hamels. We are the 2nd property on the right (opposite the historic Milner Barn). Sturry is on the high speed East Kent train service from London St Pancras, with journey times of just under an hour. Trains to Canterbury West are more frequent, and it is only 5 minutes by taxi from Canterbury West to Sturry. From the M2, the fastest route avoiding Canterbury traffic is the A299 (signed Margate) then the Herne Bay / Sturry exit onto the A291. Approaching Sturry from the north, cross the railway line, then first right (just past the pedestrian crossing) into Sturry village. Turn left just after the Co-op shop, then first right into the Hamels. We are the 2nd property on the right (opposite the historic Milner Barn). From Canterbury, take the A28 (Margate Road). On entering Sturry, take the first left in to Sturry village. Turn left just after the Co-op shop, then first right into the Hamels. We are the 2nd property on the right (opposite the historic Milner Barn). From Calais, cross the Channel by Eurotunnel, then use the M20, B2068 to Canterbury and A28 to Sturry. For those who prefer a more direct scenic route avoiding traffic, we recommend instead of using the M20 taking the small road via Frogholt and Etchinghill to Lyminge, Elham, Barham. Either join the A2 to go via Canterbury, or take the cross country route via Bridge, Patrixbourne and Fordwich. Our offices are located just off the National Cycle Route 1, which runs from Dover in Kent, via the east coast (Chelmsford-Colchester-Ipswich-Norwich-Fakenham-King's Lynn-Wisbech) to Edinburgh in Scotland, and then to the Shetlands. Cycle Route 1 goes through Fordwich. From here cross the A28 into Sturry. Our nearest airport is Manston (Kent International Airport, Manston). For private planes the landing and parking charges start from £16 and £5 respectively. From Manston airport (by car or taxi) take the A28 towards Canterbury. On entering Sturry, after the level crossing first right in to Sturry village. Turn left just after The Co-op shop, then first right into the Hamels. We are the 2nd property on the right (opposite the historic Milner Barn). Small boats can be taken from the sea up the Stour as far as Fordwich, just a few minutes walk from our offices. Larger boats will need to moor in Sandwich. Mooring fees are £7.80/day on Sandwich Quay.